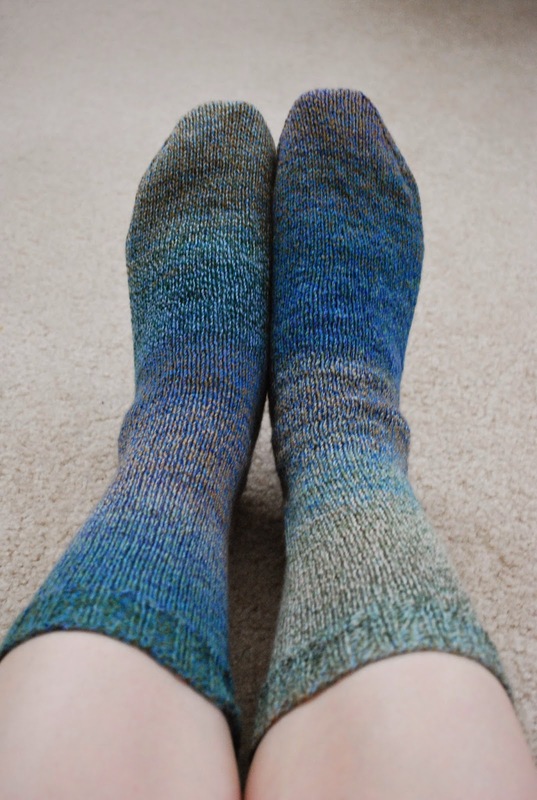 I have finished my Mixed Blessings Club socks! These took a bit longer than they should have because I had to knit the foot of the first sock twice, but the second sock at least was a very quick knit. These are nothing special, just plain stockinette, but I did do a slightly different heel. I worked gusset increases at the same time as the heel flap (so I was working in the round the whole time) and then worked back and forth after the heel turn to decrease away the extra stitches. I kept working in the (sl1, k1) pattern on right side rows for that section in order to add some extra durability to the area under my heel. I really love the way the colors shifted and changed in the knit fabric. Spinning a four-ply sock yarn took a bit of extra time, but I think it was worth it and it's definitely something I'll do again. Now that these are off the needles, I've moved on to another skein of handspun (one that came with me to Disney World but never got any attention). This is Falkland, which I've never used for socks before but am hopeful that it will be a good choice. Falkland is a little hardier than merino, in my opinion, so I'm hoping it'll stand up to wear a little better. These socks will be coming with me to MDSW -- three more days! It's now less than a week until Maryland Sheep and Wool 2014. I'm still trying to spin up the fiber I bought at last year's festival, though I've come to grips with the fact that I probably won't get it all done (the CVM is not going to get spun this week, I don't think). 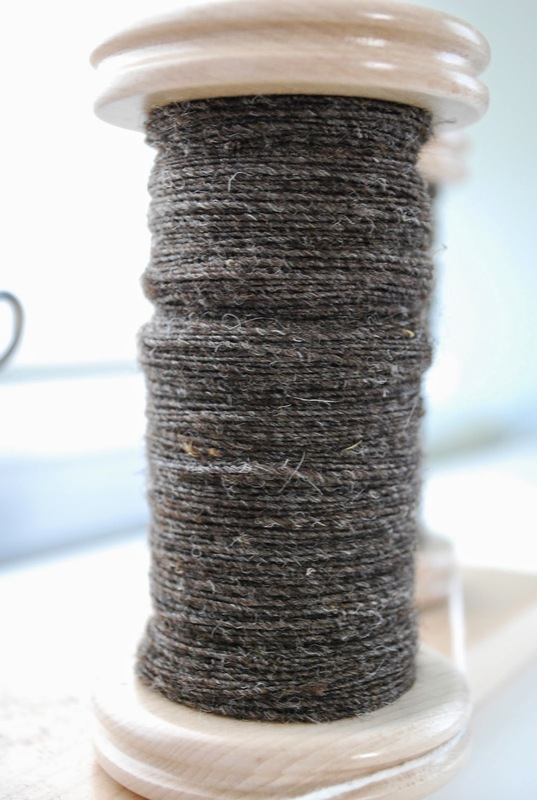 On Friday night I pulled out the second half of the natural Jacob fiber -- the lighter portion, and started spinning. This shade, for some reason, is spinning a lot more easily than the darker part. I finished this first bobbin up in one sitting, and it wasn't even a long sitting (less than two hours, I'd say). I started the second bobbin yesterday afternoon and finished it up this morning. The third bobbin is now nearly halfway done, and I'm going to attempt to finish it this evening. Then I can ply tomorrow or Tuesday, giving me one last finished skein for the month. I am toying with the idea of taking my miniSpinner to MDSW, but I think a spindle might be a better bet. I am looking forward to a weekend away and all the knitting and spinning I want! The shawl is done, and I am in love! I was so excited to be done with it that I knit the last couple of rows yesterday morning before work and then bound off during my lunch break. Almost as soon as I got home yesterday evening, I wove in the two ends and threw it in the tub to soak. Then, after Rainbow was asleep, I blocked it. By this morning, it was dry (and Rainbow even helped me to unpin it!). I couldn't be more thrilled with the results. It came out bigger than I'd anticipated, but that's probably a good thing. I did end up having plenty of yarn to finish, though I won't say I wasn't nervous that I'd run just short. I kept the length of yarn that I wound off at the beginning when I discovered the nibbles, so I had that bit as a backup just in case. Now that the knitting is done, the next step is converting all my hand-drawn charts into digital ones and writing up the pattern. That will take a bit of time, but it's something I can work on in bits and pieces. My goal was to get the shawl done in time to wear it to MDSW, and I met that goal with more than a week to spare. Really, it didn't take me all that long to knit it -- I started it on April 7, but keep in mind that I was away for five days in there and I didn't work on it every day that I was home, so it was probably less than two weeks total of knitting time. And, call me crazy, but I kind of want to knit it again (perhaps in handspun?). For now, I'm just going to enjoy seeing it draped around Matilda until it's time to drape it around me. We're now back to the normal schedule, which has been tough to get used to but I'm dealing with it. There is something to be said for predictability (not to mention sleeping in your own bed every night). Of course, lace looks like complete crap until you block it. I've given myself a bit of a preview by stretching out portions of it to get an idea of what it will look like, but it's now slightly too big to stretch out on the needles, so I'll have to wait until it's done to get the full picture. I got through most of my planned border last night, which would have meant two more rows and a bind off tonight, but thinking about it kept me up last night when I was trying to go to sleep, which means that tonight I'll be ripping out the border (all the while kicking myself for not putting in a lifeline after I finished the last chart -- which I totally thought about doing but didn't because I was too lazy to go get the thread and a needle to insert it). The border I was using just isn't playing as nicely with the end of the last chart as I would have liked, so I'm going to tweak it a bit. Fortunately it looks like my yarn supply will last, provided I don't make the border too large. I'm sure I'll be cutting it close enough to make me nervous. With any luck, I'll be able to finish this up tonight, block it tomorrow, and be able to show it to you later in the week. I had long been wanting a dress form and finally broke down and bought one earlier this month. Rainbow has dubbed her Matilda, and she'll be doing me a great service by modeling shawls and other accessories so that I can do the photography and get the shots I want. Usually I'm the model and the Mister is the photographer; he can get good shots, but his eye is usually more on me than on the knitwear. I think the new set-up will make both of us feel a lot better about photo shoots. And we're back. As vacations go, it was a good one, though not a particularly relaxing one. I was wearing my new-to-me FitBit the whole time and logged 15,000+ steps the three days we were at the parks (and as Rainbow has a much smaller stride than I, I can only imagine how many steps she took in those three days!). We went on many rides, met several princesses, and shopped quite a bit. She was thoroughly enchanted with the whole thing, which is exactly what I was hoping for. I did get some knitting done, but not nearly as much as I had anticipated (I didn't even get through one skein of the three I took). In fact, all I have to show for this vacation is one finished handspun sock. What this photo doesn't show, however, is that I knit the foot of this sock twice. I had decided to try out an experiment with a simultaneous heel flap and gusset -- something I've done before, but with the gusset increases moved to a different position. I got to the point where I was ready to Kitchener the toe (and thankfully I had not yet cut the yarn) when I thought it was a good idea to try on the sock to see how it fit. It did not fit at all, so I ripped back to the beginning of the heel flap and started over with a tried-and-true method. Somehow I managed to screw it up again (which I discovered when I started the toe at the airport yesterday and found I had two less stitches than I should have), but I was not about to rip it out again. I finished the toe, wove in my ends, and cast on for the second. I'm very much hoping that I'll have no use for these socks when they're finished, but it will be good to get them off the needles before the month is over. Tomorrow it's back to the grind, and this week I'll get back to my normal blogging schedule. 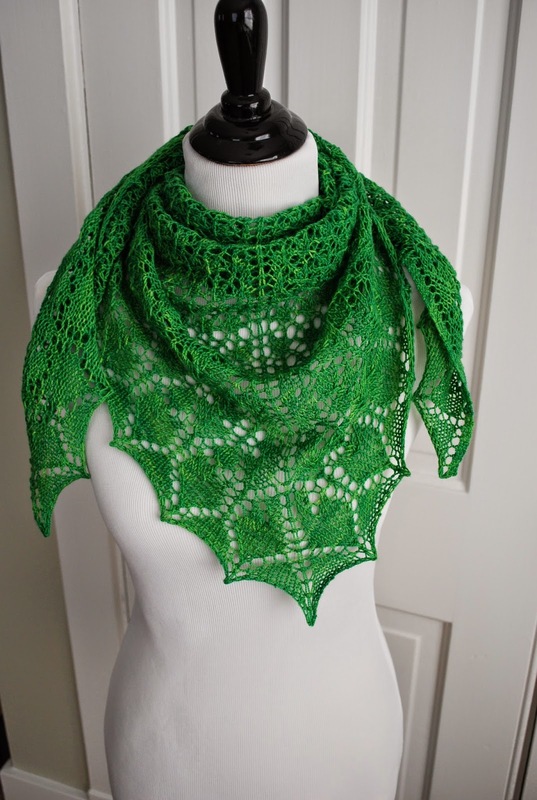 I have a lace shawl and a sweater that have made some significant progress since you saw them last, and I have a fun new piece of knitting and design-related equipment to share with you. We are off to Disney World in just a few hours, and I have one sock on the needles and two more skeins of sock yarn in my suitcase (I threw in an extra in case of an emergency). I doubt I will be posting again before we're back, so see you on the flip side! As much as I love spinning dyed fiber, there is something to be said about the simple elegance of naturally colored wool. My latest is chocolatey brown Jacob that I bought at MDSW last year. I split it in thirds and spun it up into a three-ply worsted weight. I ended up with about 191.5 yards -- not my best, but decent. I'm planning on spinning the other 4 oz. I have (in a lighter color) to match, so they should work well for a pair of mittens and a hat or somesuch. This yarn definitely isn't soft enough to wear next to my skin anywhere other than my hands. But it's rustic and wooly and sheepy and I love it. The blog is going to be pretty quiet this coming week; we are taking Rainbow on her first trip to Disney World, and while I'm bringing some knitting with me, I doubt I'll have much time or energy to blog about it. I promise to catch you up on everything when we're back next weekend. In the meantime, I hope spring has sprung (if you're in the Northern Hemisphere) and you're enjoying the extra sunshine. It's been a crazy week. Work has been really busy, both because it's a busy time of year and because I'm preparing to be off most of next week and have been trying to wrap up some big projects. On top of that, I've been getting stuff ready for next week, when we're taking Rainbow on her first trip to Disney World. We haven't told her yet (we're waiting to tell her to make it as big a surprise as possible), so all the planning ahead that I've needed to do has had to be done after I get her to sleep. These aren't anything terribly exciting -- just a knit/purl pattern. I wanted something a little different from a plain stockinette sock, and I thought the texture would help to break up the pooling a bit. Almost as soon as these were done, I cast on for the next pair. These are in the four-ply handspun from my first Fat Cat Knits fiber club shipment. I'm sticking with a ribbed cuff and a plain stockinette sock for these, though I'm going to try something a little different for the heel and gusset. As always, knitting with handspun is a real treat. I'm actually a little surprised at how thin the yarn is (though it's probably not as thin as I think and it may just be a trick of the eye after working with STR, which is on the thick side of sock yarn). So far, the color hasn't changed all that much, but I'm looking forward to seeing how the color changes in the four plies translate into knit fabric. About a year ago, I took a class at my LYS with Kirsten Kapur on lace design. I did some charting in the weeks that followed and even bought a skein of sock yarn for the intended design but never got around to knitting it. Last night, I decided the time was right. I pulled out my chart, the yarn, and a pair of needles and got to work. About 20 or so rows in, though, I discovered a spot in the yarn where most of the strand appeared to be broken or cut. I didn't think much of it (I tinked back to the beginning of the row, broke the yarn at the weak spot, and carried on, planning to weave in the ends later) until I looked at the yarn cake and saw what appeared to be several strands that were in the same condition. Immediately, I panicked a bit. While a single cut could have been a fluke -- the yarn could have caught on something or been inadvertently snipped when I was cutting off the ties to wind it -- several breaks in the same spot suggested that something had been nibbling on it. Fortunately, the dreaded spot was isolated to one spot near the outside of the cake and I was able to wind off the affected yarn and carry on. I'm also lucky that this yarn (Done Roving Yarns Frolicking Feet) comes in a very generous 480 yards per skein. I weighed everything and what was left after I pulled off the nibbled part, and it appears I still have a good 450 yards, which should be enough for this shawlette. I also immediately inspected the other yarn that was in the same bag as this skein and put it into Ziploc bags. I didn't see any damage to any other skeins, and it's possible that this particular skein was attacked when it was sitting out on the radiator in my bedroom for several months (I had hoped that seeing it every day would inspire me to get moving with the design). I'll admit that I'm perhaps not as proactive as I could be in keeping my yarn inaccessible to things that like to nibble on it, but I've been lucky thus far. Here's hoping that my luck continues. In the meantime, I've made a bit of a start on the second attempt at the shawl, and it's working out lovely so far. 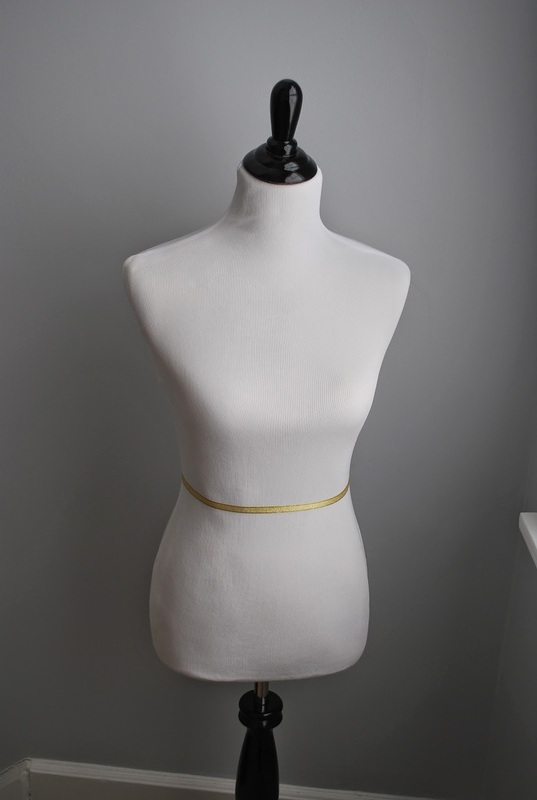 My (perhaps overambitious) goal is to have this done to wear it to MDSW, though that might be pushing it considering that we'll be away for much of next week and it will not be a trip that's conducive to lace knitting! After not touching my wheel for about a week, I've spent probably five hours at it this weekend. I think I mentioned that I've been trying to spin up the fiber I bought at MDSW last year before it's time to go again this year. At the top of that list is the 8 oz. of naturally colored Jacob (4 oz. in two different shades). I started with the chocolate brown, splitting it into thirds and spinning each third onto its own bobbin. This was really a quick and dirty spin -- I spun it pretty quickly, without worrying too much about consistency. As a result, the singles are a bit lumpy bumpy, but I think they'll even out a bit after plying. I really like how rustic these these singles are, both because of the bits of VM (most of which I'm pulling out) and the slightly heathered look from variations in the fiber color. I'm thinking that this should ply up to a worsted/Aran weight, and I will likely spin the lighter color in the same way to get two skeins that more or less match. They would go together nicely as some sort of colorwork (perhaps with natural white/cream sheep motif?). Plying will happen in another day or two, once the singles have a little time to rest. I used my fast flyer to spin these singles (mostly because it's what I use most of the time and I was too lazy to switch out my flyers), so as a result there's a bit of extra twist in them. I will be plying on the miniSpinner, though, because I don't think a regular Lendrum bobbin will be able to hold this skein! Last night, I cast on for a new sweater. I didn't get very far (partly because of a certain someone who took a while to get to sleep and partly because I misread and had to tink back a couple of rows), but it's a start. It's a bit tricky to get a picture of this because of the curling fabric, but this is the beginning of the back. 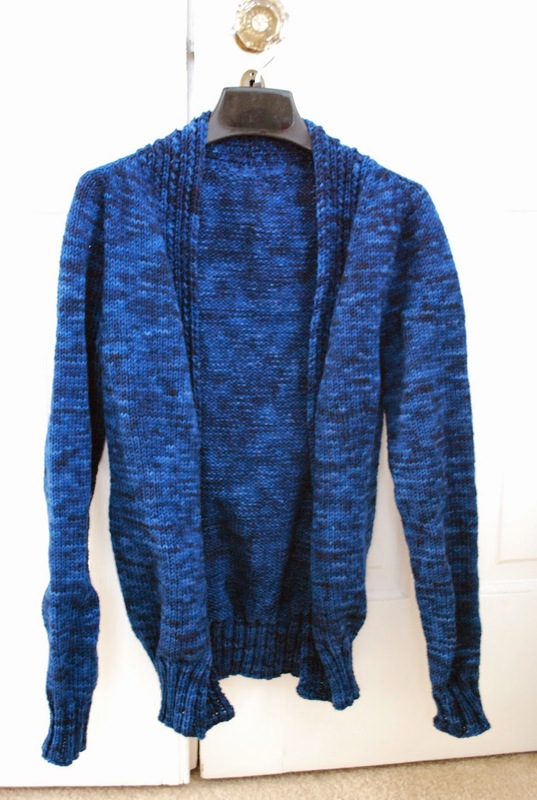 This sweater has a rather interesting construction -- you start with a provisional cast on for the back neck, work some short rows, and then work down the back a bit, adding in some shaping for the arm holes. Then you put some of the provisionally cast on stitches back on the needles and work the two fronts. Later, the sleeve caps are shaped using short rows. The whole thing is entirely seamless but has the look of a set-in sleeve -- quite clever, I think. Once again I am finding myself utterly smitten with the yarn (Yarn Hollow Tor DK). The color is so beautiful, and the hand on the yarn is fabulous. I am probably going to start alternating skeins at some point, though right now I think the extra loops on the edge might cause more problems. I did not alternate skeins at all on Rainbow's Little Oak, and I can't see any visible line where I went from one skein to another, so I could conceivably be okay with using just one skein at a time. I'm not sure yet if I want to risk it. We'll see. My Kalish socks are still moving along; I've reached the gusset on sock #2. It should be smooth sailing from here on out -- for some reason, feet always seem to go faster for me than legs, even though there's more length in the foot. I hope to have this pair finished up soon so I can cast on for a pair in handspun! 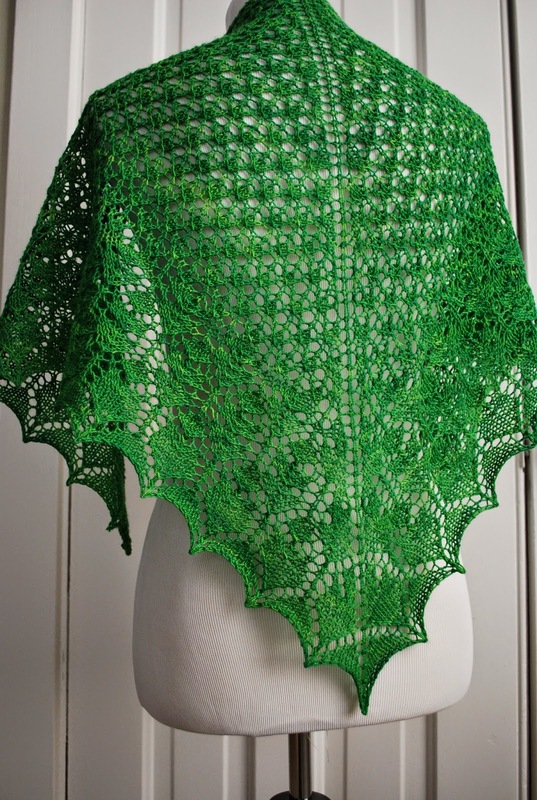 It obviously still needs a good blocking, but look, my Zephyr is done! It's not entirely wearable just yet. I'm still in search of toggles or buttons for the closures on the outside (the pattern says to use hook-and-eye closures for the inside), so I haven't sewn on the loops just yet, although they're done and waiting. Later this week I'll have a good look through my button collection, and if there's nothing appropriate there, I'll go button hunting at my LYS this weekend. As I predicted, as soon as I finished this sweater, the weather seemed to change to spring (although we did drive home through a blowing snow storm on Sunday! ), so this likely won't get worn anytime soon. Still, I like making sweaters in the warmer months because it means I have a bunch of new things to wear when it gets cold again in the fall. I started a new hat design in the car using some leftover Imperial Yarn Tracie Too. I started with a hemmed brim and then transitioned into a lace pattern (which looks much better stretched out/blocked, let me tell you). I'm still figuring out the crown, but this will be a slouchy beret-style hat -- something fun and relatively quick. After putting the finishing touches on Zephyr last night, I was a good knitter and swatched for my next sweater with the Yarn Hollow Tor DK I bought last weekend. The pattern calls for a US 6 to make gauge, but I knew I had used a US 4 to get the same gauge with the same yarn in Rainbow's Little Oak, so that's what I started with. After washing, I'm getting nearly perfect stitch gauge, though my row gauge is a little off (I'm getting eight rows per inch rather than seven), but I can work with that. I don't know if I'll cast on tonight or just work on the hat for a bit, but this will be my big project for this month.